Welcome to Karon Sunshine Guesthouse, Bar and Restaurant, in tropical Phuket, Thailand -.a boutique style establishment that is Australian owned and operated. Our Guesthouse is perfectly located, only 5 minutes walk to the crystal clear waters of the Andaman Sea and close to Karon's nightlife, shopping and entertainment area yet far enough away from the action for you to enjoy a great night's sleep. All our rooms have recently been refurbished and are clean, quiet and comfortable. Our restaurant offers a broad range of International and authentic Thai cuisine and the bar has a full range of beers, wines spirits and cocktails. 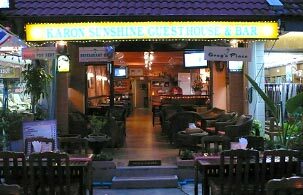 If you like warm, genuine and personable hospitality the Karon Sunshine, Guesthouse, Bar & Restaurant is spot on! " Check out time 12.00 noon, late checkout half day/ full day room rates apply. Superior/Standard rooms have windows with a view outside of the building. Our Economy room does not have windows with a view. It has louver windows at the ceiling but no view outside. Room booking will be confirmed when advise is received that the money has been sent. When the cancelled room is re sold the outstanding balance on the total room cost will be refunded. No show Terms: total cost of the room will be charged, no refund. Shorten length of stay Terms: When the room is re sold the balance on the total room cost will be refunded.